The glutamate decarboxylase (GAD) system of Lactobacillus brevis involves two isoforms of GAD, GadA and GadB, which catalyze the conversion of L-glutamate to γ-aminobutyric acid (GABA) in a proton-consuming reaction contributing to intracellular pH homeostasis. However, direct experimental evidence for detailed contributions of gad genes to acid tolerance and GABA production is lacking. Molecular analysis revealed that gadB is cotranscribed in tandem with upstream gadC, and that expression of gadCB is greatly upregulated in response to low ambient pH when cells enter the late exponential growth phase. In contrast, gadA is located away from the other gad genes, and its expression was consistently lower and not induced by mild acid treatment. Analysis of deletion mutations in the gad genes of L. brevis demonstrated a decrease in the level of GAD activity and a concomitant decrease in acid resistance in the order of wild-type> ΔgadA> ΔgadB> ΔgadC> ΔgadAB, indicating that the GAD activity mainly endowed by GadB rather than GadA is an indispensable step in the GadCB mediated acid resistance of this organism. Moreover, engineered strains with higher GAD activities were constructed by overexpressing key GAD system genes. With the proposed two-stage pH and temperature control fed-batch fermentation strategy, GABA production by the engineered strain L. brevis 9530: pNZ8148-gadBC continuously increased reaching a high level of 104.38 ± 3.47 g/L at 72 h.
This is the first report of the detailed contribution of gad genes to acid tolerance and GABA production in L. brevis. Enhanced production of GABA by engineered L. brevis was achieved, and the resulting GABA level was one of the highest among lactic acid bacterial species grown in batch or fed-batch culture. Lactic acid bacteria (LAB) comprise a heterogeneous group of commercially important microorganisms extensively utilized in a large variety of food fermentations including dairy, meat, fish and vegetable products . The growth of LAB is characterized by the generation of acidic end products of fermentation, which accumulate in the extracellular environment, lowering the pH and preventing the growth of spoilage bacteria [2, 3]. This distinctive feature is the basis of widely practiced methods of food preservation via fermentation . However, acidification also has a detrimental effect on the cellular physiology of LAB, reducing the activity of acid-sensitive enzymes and damaging proteins and DNA. As the roles or functions of LAB are directly related to their acidogenicity (ability to produce acid at low pH) and acidurance (capacity to function at low pH) , it is important to understand how LAB sense and subsequently adapt to the acidic environment and what contributes to these adaptations. Living cells are critically dependent on cytoplasmic pH homeostasis because most proteins have distinct pH ranges within which they can function [6, 7]. To counteract the acidification of the extracellular environment, LAB employ a complex but efficient combination of active and passive acid resistance systems [7, 8]. Remarkably, among various types of acid responses and tolerance mechanisms, the GAD system is regarded as one of the most potent acid mitigating pathways. In this system, intracellular protons are consumed through decarboxylation of glutamate in the cytoplasm and exchange of the reaction product GABA with extracellular glutamate, which contributes to protecting cells from the acid stress encountered during food fermentation and in the gastrointestinal tract [9, 10]. The existence and mode of action of the GAD system was first examined in LAB more than 65 years ago . In addition to being the major acid survival pathway was confirmed in Lactococcus lactis  and Lactobacillus reuteri , the glutamate-dependent system has also been studied in LAB due to the link between glutamate decarboxylation and ATP synthesis through the generation of a proton motive force (PMF) . Moreover, by combining the attributes of a GRAS status of food fermenting LAB and the physiological functions of GABA in the mammalian central nervous system, such as hypotensive, hepatic encephalopathy and diabetes reduction [14–16], many researchers have focused on investigations into GABA-producing LAB from various viewpoints. Some of these perspectives include the genetic and biochemical characterization of GAD, and GABA production based on the medium composition or fermentation condition [17, 18]. Among a variety of reported LAB species, Lactobacillus brevis strains are the most frequently isolated from traditional fermented products with the highest GABA productivity [17, 19, 20]. GABA production using L. brevis as bacterial cell factories is therefore a focus of research [21–24]. Previous investigations have shown that in contrast to other LAB species, the L. brevis chromosome generally contains distinct genes encoding two biochemically identical isoforms of GAD: GadA and GadB [23, 25, 26]. Additionally, the gadC gene, located upstream of gadB, has been proposed to encode the antiporter implicated in GABA export [23, 26]. Notably, although transcriptional levels in several L. brevis strains are typically analyzed by measurements of relevant mRNA abundance [23, 26, 27], the physiological role and regulatory mechanism of the GAD system in this species remains largely unclear. In addition, direct experimental evidence for the detailed contribution, if any, of gad genes to the acid tolerance and GABA production of L. brevis is lacking. Because understanding the role and regulation of the GAD system is a prerequisite for exploiting such characteristics of acid resistance and GABA production, it is necessary to gain a deeper insight of role of the glutamate decarboxylase-dependent system in the physiology of L. brevis. To address the above issues, in the present work we focused our attention on the high GABA-producing strain L. brevis CGMCC1306 [21, 28, 29], with the aim of identifying genes that may explain its ability to grow under acid conditions and its GABA production. To further enhance GABA production from L-monosodium glutamate (MSG), recombinant L. brevis strains overexpressing GAD system key genes were constructed based on a nisin-controlled gene expression system (NICE) . Moreover, a two-stage pH and temperature control with substrate feeding strategy was also developed to enhance the production of GABA. The genetic determinants of the GAD system in several representative strains of LAB were characterized, as shown in Fig. 1. 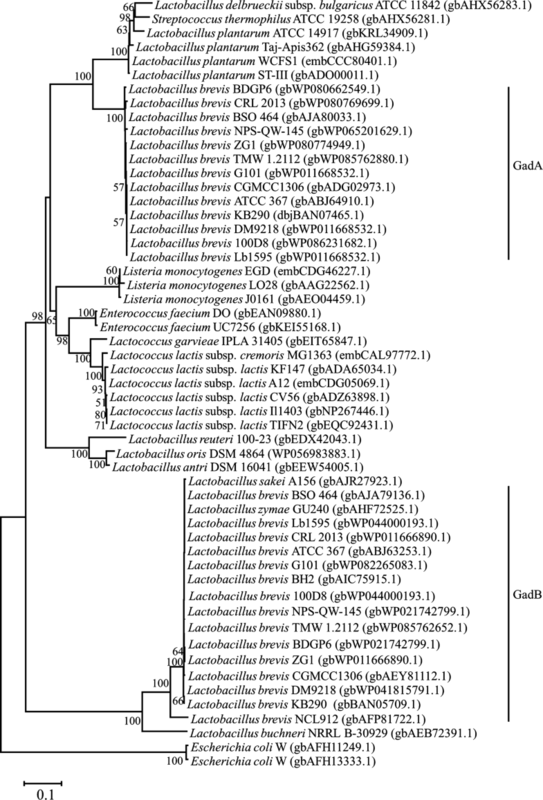 The gene organization present in L. brevis differs from the previously characterized GAD gene clusters in L. lactis , Lactobacillus acidophilus  and L. reuteri . In particular, sequence analysis revealed that existence of two different GAD-encoding genes (gadA and gadB) in strain CGMCC1306. Indeed, this is a common characteristic shared by L. brevis strains (Fig. 2), except for L. brevis NCL912, with only one cloned gene encoding GAD . The gadB is linked to the glutamate/GABA antiporter gene (gadC), and gadA is located separately from the other gad genes. In E. coli , Shigella flexneri  and Brucella microti , gadC genes are preceded by gadB, whereas the gene order in L. brevis is gadC followed by gadB. The gadC gene is preceded by an 8-bp inverted repeat (IR; ΔG[25 °C] = − 9.5 kcal/mol) and a possible ribosome-binding site (Additional file 1). In addition, no putative promoter or terminator signals were identified in the 52-bp intergenic region between gadC and gadB, which suggests that they may form an operon, i.e., gadCB. An additional gene, gadR, located upstream of gadC codes for a putative transcriptional regulator of gadCB. The deduced amino acid sequence is homologous (66% identify) to GadR, a possible positive regulator involved in expression of gadCB in L. brevis NCL912 . Similarly, gadR is preceded by an 18-bp inverted repeat (IR; ΔG[25 °C] = − 18.2 kcal/mol) and a possible ribosome-binding site (Additional file 1), which suggests that transcription of gadR might be independent of the gadCB operon. In particular, the gadRCB gene cluster in L. brevis CGMCC1306 shows the same gene order and organization as in L. lactis subsp. lactis CV56, L. lactis subsp. cremoris MG1363 and L. buchneri NRRL B-30929. However, there is no evidence that the gadR gene exists in other LAB species, except for strain L. sakei A156, the genome sequence of which has not yet been published . In line with these differences, gadC and gadB of L. brevis and those genes of L. sakei share high sequence identity but are more distantly related to these genes in L. lactis, L. reuteri and L. plantarum. To determine whether gad system genes in L. brevis CGMCC1306 are subject to acid-induced transcriptional regulation, a reverse-transcription quantitative PCR assay was performed in which the expression levels of all four gad genes were determined. When cells were grown in yeast extract peptone (GYP) medium under acidic conditions (pH 5.2), the relative expression levels of gadR, gadC and gadB differed by 0.2- to 17.4-fold from the control group (cells cultured in GYP medium for 6 h). The highest expression levels were found in the case of the last two genes of the gad cluster, gadC and gadB. Moreover, transcription of gadC and gadB was synchronous (Fig. 3b). The expression level was highest at the late exponential phase of growth. Upon further fermentation, a sharp decline in overall relative expression levels of the gad genes was observed from the start of the stationary growth phase. At pH 6.8, a less pronounced decrease in the relative expression levels of gad cluster genes was found compared to those at pH 5.2. As shown in Fig. 3d, the increased expression of gadRCB genes was nearly undetectable. Notably, overall expression of gadA gene was consistently low and did not change in response to acid (pH 5.2) or neutral (pH 6.8) conditions. These results clearly demonstrate that expression of the gadCB operon is pH dependent, while expression of the gadA gene is constitutive. In addition, the transcriptional level of gadC was identical to that of gadB, further suggesting the existence of a gadCB operon in this strain. Indeed, this is consistent with PCR analysis verification (Additional file 2). To explore the relationship between gad gene expression and GABA levels, GABA concentrations were determined under different fermentation conditions. The results showed that pH had a significant effect on the kinetics of MSG conversion and cell-bound GAD activity. As shown in Fig. 3a, when 75 g/L of MSG was used as the substrate, 34.9 g/L of GABA was produced after 30 h of batch reaction under acidic conditions (pH 5.2). Conversely, no obvious conversion of MSG to GABA occurred in pH-controlled fermenters at a pH value of 6.8 (Fig. 3c). Overall, there was a good correlation between expression of gadRCB and GABA production in L. brevis CGMCC1306. A positive correlation between cells possessing GAD activity and the gene expression levels of the gadCB operon was observed, suggesting that L. brevis CGMCC1306 may employ gadCB gene products rather than GadA for its main GAD activity. To investigate this possibility, deletions in gadC, gadA and/or gadB were generated using the double crossover homologous recombination method, as described previously . Because different GAD activities were observed during the various growth phases (Fig. 3a), the GAD activity assay was conducted on parent and mutant strains under two conditions: cells in exponential (EXP. ; 12 h) and early stationary (EARLY-STAT. ; 30 h) phases (Table 1). For exponential phase cells, deletion of gadA resulted in a small reduction in cell-bound GAD activity; however, deletion of gadB in L. brevis led to a more significant decrease, reducing activity by approximately 16.2-fold. As expected, GAD activity was essentially eliminated in the ΔgadAΔgadB double mutant. It is noteworthy that very low levels of activity remained in the ΔgadC mutant, and this unexpected result might have been caused by some degree of cell lysis resulting in extracellular GadB and GadA activity. In further experiments, a roughly similar trend was observed in early stationary-phase cells (Table 1). No activity was observed for the ΔgadAΔgadB double mutant, and only slight activity was found for the ΔgadC mutant. Analysis of a set of four gad deletion mutants demonstrated a dramatic decrease in the level of cell-bound GAD activity in the order of wild-type> ΔgadA> ΔgadB> ΔgadC> ΔgadAΔgadB (Table 1), indicating that GadB rather than GadA was the main contributor to the overall GAD activity under this condition. Moreover, these data indicate that this strain has no third GAD that is sufficiently active under the tested conditions to substitute for GadB. These combined results strongly suggest that pH-dependent GadC and GadB play a more important role in overall GAD activity relative to GadA, at least under the conditions tested in this study. Remarkably, in contrast with the cell-bound GAD activities measured in these mutants, the cytoplasmic GAD activity of L. brevis ΔgadC was similar to that of the wild-type strain (Table 2). This result demonstrates that GAD functions in strict association with a cognate GadC, which is localized to the cell membrane and provides a selective gate for the entry of glutamate and exit of the decarboxylation product GABA . To confirm that gadCB of L. brevis CGMCC1306 encodes proteins contributing to acid resistance, the survival of the mutants at pH 2.5 was compared with that of the wild-type strain. As shown in Fig. 4, all mutants were more sensitive to the acid challenge in the presence of MSG than the parent strain, and this distinction became more apparent over time. Similar to cell-bound GAD activity, the cell survival rate of the L. brevis ΔgadA mutant was only minimally lower after acid challenge for 5 h. However, mutant strains involving either gadC or gadB were dramatically more sensitive to acid. Additionally, this transition in the gadC mutant tended to be more obvious as the duration of exposure to low pH increased. Notably, the most dramatic decreases were observed with the exquisitely sensitive ΔgadAΔgadB mutant, which showed an approximately 1.7-log reduction in survival relative to the wild-type strain after exposure to acid for 5 h. Moreover, it was also noted that the sensitivity of the ΔgadB complementation strain L. brevis ΔgadB: pMG36e-gadB was less than that of the ΔgadB mutant and wild-type in this phase of growth (Fig. 4), which corresponds well with the GAD activity data reported above (Table 2). In conclusion, L. brevis mutants deleted for gadC or gadB were sensitive to acid, which indicates that both glutamate decarboxylase and the antiporter are essential for acid resistance. Furthermore, GadB, together with GadC, confer glutamate-dependent acid resistance to this LAB, with GadA playing a minor role. Upon observing that the pH-dependent GadC and GadB proteins were the greatest contributors to GABA production during the fermentation process, we hypothesized that increasing the expression of key GAD system genes may improve the overall GAD activity of L. brevis. Therefore, the gadB and gadCB segments were cloned into the nisin-inducible expression vector pNZ8148  and subsequently transformed into L. brevis 9530  to form L. brevis 9530: pNZ8148-gadB and L. brevis 9530: pNZ8148-gadCB, respectively. Considering the gene order of gadB and gadC in the genomes of E. coli , S. flexneri  and B. microti , another recombinant plasmid, pNZ8148-gadBC was also obtained and transformed into strain L. brevis 9530. In cells, gadB and gadC expression was under the control of the nisin-inducible nisA promoter (Additional file 3). After induction with 10 ng/mL nisin, samples of recombinant L. brevis strains grown in GYP fermentation medium under acidic conditions (pH 5.2) were collected at intervals during cultivation for extraction or determination of cell-bound GAD activity. According to SDS-PAGE analysis of whole-cell proteins, the bands observed were consistent with the predicted molecular mass of GadB (53.5 kDa) and GadC (55.2 kDa; Additional file 3), indicating that the two enzymes were well expressed under the nisA promoter in L. brevis. 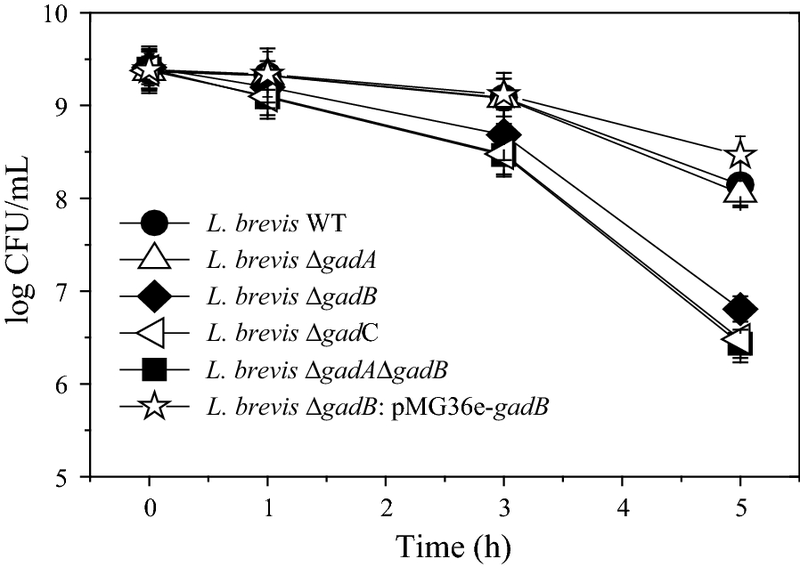 To evaluate whether overexpression of GadB and GadC effectively enhanced GABA productivity, the GAD activities of these engineered L. brevis strains were measured. As shown in Fig. 5, after 24 h of incubation, the cell-bound GAD activities of L. brevis 9530: pNZ8148-gadB, L. brevis 9530: pNZ8148-gadCB and L. brevis 9530: pNZ8148-gadBC were 0.83 ± 0.06, 0.95 ± 0.04 and 1.07 ± 0.08 U/mg DCW, respectively. As expected, all three recombinant strains exhibited higher activities than did the wild-type strain (0.69 ± 0.02 U/mg DCW). In addition, the increased GAD activity in the recombinant L. brevis strain harboring pNZ9530/pNZ8148-gadBC system was the best compared to that of the other strains. Therefore, this strain was selected for a thorough characterization of GABA production. Temperature and pH are two of the well-documented factors influencing cell growth and activity during fermentation [17, 29]. To achieve optimal conditions for maximum yield of GABA, the effects of pH and temperature on the growth and GAD activity of L. brevis cells were determined. At low temperatures, the specific growth rate of L. brevis 9530: pNZ8148-gadBC and L. brevis CK increased as temperature increased, with the maximum value observed at 35 °C, above which the specific growth rate tended to decrease (Fig. 6a). Similarly, the effect of pH on the specific growth rate is shown in Fig. 6b. The optimum pH for growth of engineered strain was pH 5.2, which was also consistent with that of L. brevis CK. Furthermore, the effect of temperature on cell-bound GAD activity was examined at temperatures ranging from 20 to 50 °C (Fig. 6c). At 20 °C, the GAD activity of the engineered strain (0.20 ± 0.03 U/mg DCW) was similar to that of the control strain (0.16 ± 0.02 U/mg DCW). 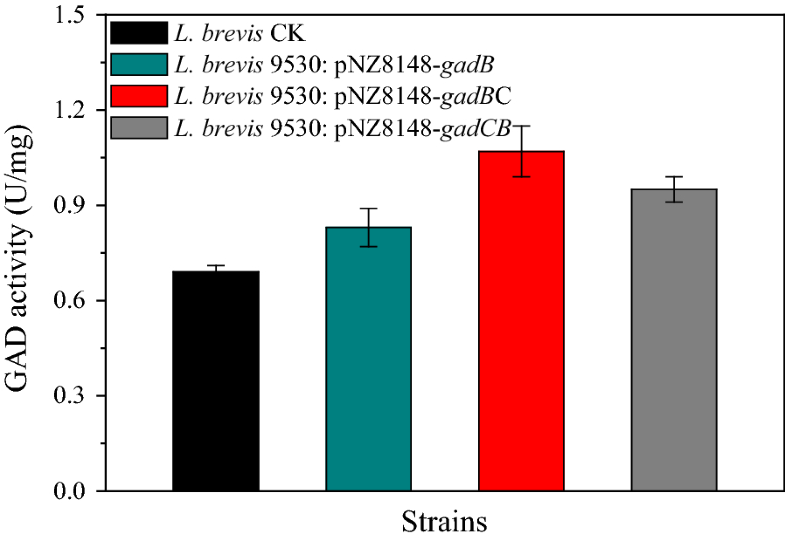 As expected, GAD activity increased with temperature increase for both strains, but the increase was larger for L. brevis 9530: pNZ8148-gadBC, approximately 39.2% higher at the optimum temperature (40 °C) than L. brevis CK. Moreover, it is worth noting that the highest GAD activity of L. brevis 9530: pNZ8148-gadBC was obtained at pH 4.4, followed by pH 4.8, pH 5.2 and pH 4.0 (Fig. 6d). Obviously, the optimum pH for cell growth and GAD activity is not fully coupled, as was the case for temperature. To address the coupling of cell growth with GAD activity described above, a fed-batch fermentation with two-stage pH and temperature control strategy was proposed for improving GABA production. In the first stage (0–24 h), pH and temperature were set at pH 5.2 and 35 °C, respectively, to promote cell growth; in the second stage (24–102 h), the pH and temperature were changed to 4.4 and 40 °C, respectively, to favor GABA production. The fermentation dynamics of L. brevis 9530: pNZ8148-gadBC are shown in Fig. 7. The GABA content increased rapidly with fermentation time from 12 to 48 h after inoculation, increased slowly from 48 to 72 h, and then hardly increased as time progressed. After 102 h of fermentation, the volume of culture broth had increased to approximately 3.7 L due to the inoculation, substrate feeding and addition of neutralizer. Additionally, GABA concentrations were 89.45 ± 3.24 g/L, 104.38 ± 3.47 g/L and 105.32 ± 2.53 g/L at 48 h, 72 h and 102 h, respectively. GABA production by strain L. brevis CK with the proposed two-stage fed-batch strategy was also assessed (Additional file 4). However, the GABA concentrations were found to be 72.91 ± 2.46 g/L, 82.47 ± 2.49 g/L and 86.35 ± 3.71 g/L at 48 h, 72 h and 102 h, respectively, notably lower than those of the engineered strain. Based on a comprehensive consideration of GABA productivity and economic analysis, 72 h is recommended as the optimal fermentation time in future practical production. Diverse mechanisms for pH sensing and cytoplasmic pH homeostasis enable most LAB to tolerate or grow at external pH values that are outside the cytoplasmic pH range that they must maintain for growth [6, 7]. Among the most preferred mechanisms are the pumping out of protons, production of alkaline compounds and proton-consuming decarboxylation reactions . Nonetheless, research increasingly suggests that the acid resistance of LAB might be strain specific and stress specific because of the genetic diversity of these acid alleviating systems among different strains [12, 23]. Furthermore, each of the various components of these pathways can be adapted in several different ways to promote survival in acidic environments [7, 32]. Therefore, the challenge becomes understanding how acid stress response systems have adapted in an individual LAB species. As mentioned above, several systems have been employed to withstand low-pH stress, but the GAD system is regarded as one of the most important pathways in some LAB strains [9, 10]. Glutamate decarboxylation to GABA contributes to the acid resistance of E. coli , Listeria monocytogenes , S. flexneri , L. lactis  and B. microti  have been characterized. However, research on the physiological function and regulatory mechanism of the GAD system in Lactobacillus species is scarce. Given the link between acid resistance phenotypes and the organization of GAD system genes, the present study was initiated to investigate the contribution of gad genes to the acid tolerance of the high GABA-producing strain L. brevis. Lactobacillus brevis CGMCC1306 contains genes encoding two GADs (GadA and GadB) and a glutamate-GABA antiporter (GadC). In E. coli, S. flexneri and B. microti, gadC genes are preceded by gadB [33–35], whereas gadC in L. brevis is located adjacent to but upstream of gadB . Indeed, the arrangement of gad genes is a common characteristic shared by most GABA-producing LAB strains (Fig. 1b). To our knowledge, after E. coli and L. monocytogenes, L. brevis is only the third species in which two glutamate decarboxylase genes have been identified. Based on an analysis of the genetic organization of the GAD system, the physiological adaptation of this strain to different culture conditions was further evaluated using quantitative reverse transcription PCR. The results demonstrated that gadCB forms an operon in strain L. brevis CGMCC1306. Moreover, expression of the gadCB operon was greatly upregulated in response to low ambient pH when cells enter the late exponential growth phase, whereas expression of the gadA gene was consistently lower and did not change in response to acid or neutral conditions. There are also obvious differences in gadR expression levels among LAB strains. In L. brevis NCL912 , the expression levels of gadR were 13- to 155-fold higher than those of gadCB throughout the culture period, though far lower expression levels were observed for gadR than for gadCB in L. brevis CGMCC1306. In addition, gadR in L. lactis is constitutively expressed . Although transcriptional levels are typically analyzed by measurement of relevant mRNA abundance in L. brevis NCL912 , L. brevis TMW 1.6 , L. brevis TMW 1.465  and L. brevis NPS-QW-145 , direct experimental evidence for the detailed contribution of gad genes to acid tolerance and GABA production is lacking. Therefore, a number of acid-sensitive mutants were constructed to examine the regulatory mechanisms involved in acid resistance. Similar to L. lactis , L. monocytogenes  and B. microti , L. brevis mutants deleted for gadC or gadB were acid sensitive, indicating that both glutamate decarboxylase and the antiporter are essential for the observed acid resistance of this organism. This is also in agreement with the acid sensitivity of E. coli and S. flexneri gadC mutants [34, 41] and the L. reuteri gadB mutant  identified in previous mutagenesis studies. However, a deletion in gadA resulted in only a slight loss of acid resistance. Moreover, the most acid-sensitive mutant was L. brevis ΔgadAΔgadB, which demonstrated an approximately 1.7-log reduction in survival relative to the wild-type strain after exposure to acid (pH 2.5) for 5 h, as was the case for L. monocytogenes ΔgadAΔgadB . The above data can be summarized as follows in terms of acid resistance: wild-type> ΔgadA> ΔgadB> ΔgadC> ΔgadAΔgadB. This trend is true for cell-associated GAD activities, as verified in L. monocytogenes , indicating that the ability of mutants deleted for gad genes to survive acid stress is proportional to their ability to utilize glutamate decarboxylation to consume intracellular protons. Thus, by sensing and consuming protons, glutamate decarboxylase-mediated proton consumption and the glutamate/GABA antiporter constitute a simple molecular system that functions efficiently to protect L. brevis from the acid stress encountered during fermentation. Moreover, the glutamate decarboxylation activity endowed by GadB, as opposed to that of GadA, is an indispensable step in GadCB-mediated acid resistance and cell-bound GAD activity in L. brevis CGMCC1306. Due to the health benefits to humans, food-fermenting LAB are regarded as the most suitable candidates for GABA production , and a wide range of LAB exhibit GAD activities . Owing to the great potential in large-scale fermentation for the production of food-grade GABA, the biotransformation of glutamate to GABA by L. brevis has been extensively investigated during the last decade [17, 23]. Regardless, nearly all of the existing studies have focused on the optimal culture and transformation conditions. In this work, improving the GAD activity of L. brevis was achieved by increasing the expression levels of key GAD system genes. 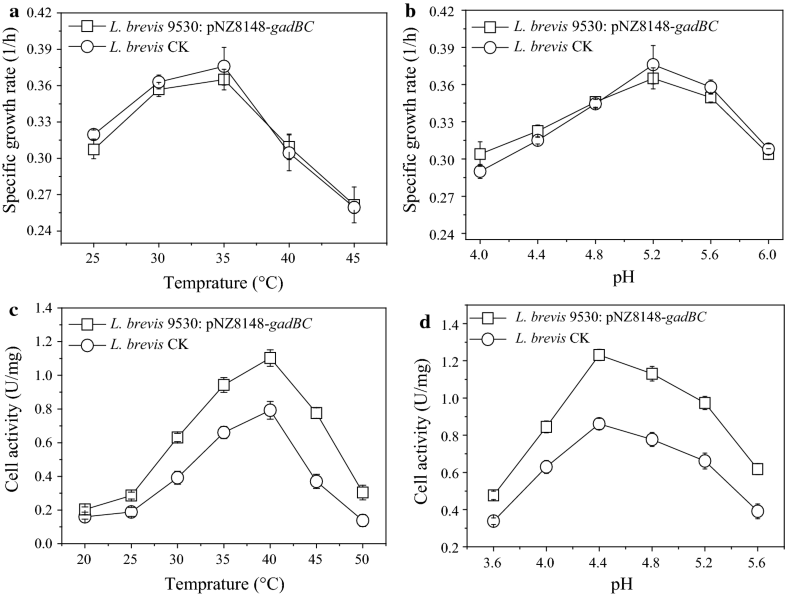 Moreover, using the proposed two-stage pH and temperature control fed-batch fermentation strategy, the GABA production by the genetically engineered strain L. brevis 9530: pNZ8148-gadBC increased continuously, reaching a high level of 104.38 ± 3.47 g/L at 72 h. Additionally, to our knowledge, the obtained GABA level is one of the highest among LAB species grown in batch or fed-batch culture. In this study, the detailed contribution of gad genes to acid tolerance and GABA production in L. brevis was determined. 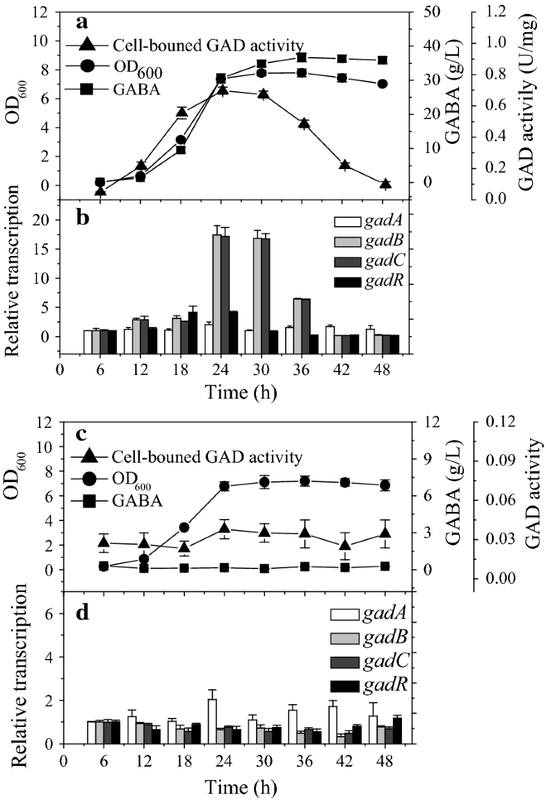 Experimental results show that GAD activity endowed by GadB rather than that due to GadA is an indispensable step in GadCB-mediated acid resistance and cell-bound GAD activity in L. brevis CGMCC1306. Moreover, enhanced production of GABA by an engineered L. brevis strain was achieved using a two-stage pH and temperature control fed-batch fermentation strategy. The obtained level of GABA is one of the highest among LAB species grown in batch or fed-batch culture. The bacterial strains and plasmids used in this work are listed in Table 3. E. coli was grown aerobically with shaking at 250 rpm in Luria‒Bertani (LB) broth at 28 or 37 °C. L. lactis MG1363 was grown at 28 °C in M17 medium supplemented with 0.5% glucose (GM17). L. brevis CGMCC1306 was generally cultured in MRS medium at 28 or 37 °C without agitation. Solid media for plating were prepared by adding 1.5% agar to the appropriate liquid media. Selective medium contained 5, 7 or 200 μg/mL erythromycin for selection of L. lactis, L. brevis or E. coli, respectively. Similarly, medium containing 10 or 20 μg/mL chloramphenicol was used for the selection of L. brevis or E. coli, respectively. During batch and fed-batch fermentations, L. brevis cells were grown in glucose yeast extract peptone (GYP) medium as described previously , with minor modifications (g/L): glucose, 20; yeast extract, 15; peptone, 5; MSG, 75; CH3COONa, 3; FeSO4·7H2O, 0.001; MgSO4·7H2O, 0.03; NaCl, 0.001; MnSO4·4H2O, 0.02. In 48 h batch fermentations, temperature was maintained at 35 °C, and the pH was kept constant at 5.2 or 6.8. To enhance GABA production, a two-stage pH and temperature control with substrate-feeding strategy was developed. The experiments were performed in a 5-L fermentor under the following conditions: medium volume 2 L, inoculum size 10% (v/v), agitation speed 100 rpm, and fermentation time 102 h. In particular, after cultivation at pH 5.2 and 35 °C for 24 h, the culture temperature and pH were changed and maintained at 40 °C and pH 4.4, respectively, during the second phase (24–102 h). Additionally, 200-mL aliquots of MSG (140 g per aliquot) were supplemented into the bioreactor at 24 h, 36 h, 48 h and 72 h, respectively. The pH was maintained at the set value with the addition of 3 mol/L H2SO4 or 3 mol/L NaOH. The gadR, gadC, gadB, and gadA gene sequences of L. brevis ATCC367 (GenBank: CP000416) were used to identify homologous genes encoding gadR, gadC, gadB and gadA in the genome of L. brevis CGMCC1306. Gene loci of putative GAD system genes in L. buchneri NRRL B-30929, L. sakei A156, L. brevis CGMCC1306, L. reuteri 100-23, L. plantarum WCFS1, L. acidophilus NCFM, L. lactis subsp. lactis CV56 and L. lactis subsp. cremoris MG1363 were analyzed with the BLASTx program against NCBI databases (http://blast.ncbi.nlm.nih.gov/Blast.cgi). The sequences of GAD system proteins from various species were retrieved from NCBI and aligned to calculate similarity scores. Gene or protein sequences were aligned using ClustalX, and a phylogenetic tree was constructed with the neighbor-joining (NJ) method using MEGA 4.0. The gad genes in L. brevis CGMCC1306 were cloned and sequenced. The sequences of the 16S rDNA, gadR, gadCB operon and gadA were deposited in the GenBank database under accession numbers HQ726794, KU759571, JQ246952 and GU987102.1, respectively. The chromosomal gadA gene was deleted in L. brevis CGMCC1306 as follows. DNA fragments of 735 bp and 682 bp carrying the upstream and downstream regions of the gadA gene, respectively, were generated by PCR. These fragments contained KpnI/PstI and PstI/XbaI restriction sites at their 5′ and 3′ ends, respectively, which were introduced using gadA upstream and downstream primers (Additional file 5). The PCR-amplified products were digested with the corresponding restriction endonucleases, ligated, and cloned into the pGhost4 vector [37, 42] and its derivative to generate pGh4-ΔgadA-U and pGh4-ΔgadA-U-D, respectively. E. coli XL1-Blue cells were used as the intermediate host. The absence of PCR-induced mutations in the insert corresponding to the fused upstream and downstream regions of the gadA gene was verified by sequencing. The recombinant plasmid pGh4-ΔgadA-U-D was transformed into L. brevis by electroporation as described in our previous work . The transformant was selected on MRS plates containing erythromycin at 28 °C. After homologous recombination into the chromosome, and clearing of the plasmid as previously described , the deletion was confirmed by colony PCR amplification using the flanking primers up F and down R. Similarly, L. brevis strains ΔgadB and ΔgadC were constructed, and the ΔgadAΔgadB double mutant was further prepared using strain ΔgadA as the template for homologous recombination of ΔgadB. For overexpression of gad genes in L. brevis, gadC, gadB and gadCB segments were amplified from the genomic DNA of strain L. brevis CGMCC1306. Information regarding the primers is listed in Additional file 6. The gadCB segment was amplified using the gadCB-F and gadCB-R primer pair and ligated into the PstI and HindIII restriction sites of the vector pNZ8148  to produce pNZ8148-gadCB. Similarly, the recombinant plasmids pNZ8148-gadB and pNZ8148-gadBC were obtained successively. E. coli MC1061 was used as the intermediate host and transformed with these constructs. The recombinant plasmids were confirmed by restriction enzyme analysis and DNA sequencing, and then transformed into L. brevis 9530  (L. brevis CGMCC1306 harboring the facilitator plasmid pNZ9530) by electroporation. For expression of gadB in L. brevis ΔgadB, the gadB segment was amplified with primers gadB-F2 and gadB-R2, digested with SalI and HindIII, and then ligated into the constitutive expression vector pMG36e . E. coli DH5α was used as the intermediate host. The recombinant plasmid was also transformed into strain L. brevis ΔgadB to form L. brevis ΔgadB: pMG36e-gadB. The growth of L. brevis in GYP medium was monitored by measuring optical density (OD) at 600 nm. Cells at different growth phases were harvested, and total RNA, stabilized with RNA protect Bacteria Reagent (Qiagen), was isolated in triplicate using RNeasy Mini Kit (Qiagen) according to the manufacturer’s protocol. RNA quantification and quality assessment were carried out by UV spectrometry (OneDrop, OD-1000). For quantitative real-time PCR (qRT-PCR), extracted mRNAs were reverse transcribed to complementary DNA (cDNA) using the ReverTra Ace® qPCR RT kit (Toyobo Co., Ltd., Japan) and quantified via real-time PCR using SYBR® Premix Ex TaqTM II (Takara). Relative expression of target genes was calculated according to the comparative 2−ΔΔCt method described by Livak and Schmittgen . The 16S rRNA gene was used as a housekeeping gene, and a no-template control was used as a negative control. Ct values were normalized to the samples cultured for 6 h (control group). The primers used for housekeeping and gad genes are listed in Additional file 7. All quantitative PCRs were performed in triplicate with a StepOnePlus™ Real-Time PCR System. To evaluate acid resistance, early stationary phase cells were obtained from cultures grown until the OD stopped increasing exponentially. The cells were then washed in 50 mmol/L potassium phosphate buffer (pH 7.0), and resuspended in 50 mmol/L potassium phosphate buffer (pH 2.5) to an OD600 of 1.0. A pH of 2.5 adjusted with HCl was chosen to match the conditions previously used to determine the effect of glutamate decarboxylase on acid resistance in L. reuteri . Samples were collected after 0, 1, 3, and 5 h of incubation at pH 2.5 to monitor bacterial survival. For determination of bacterial survival, the samples were immediately mixed with phosphate-buffered saline (PBS, 137 mmol/L NaCl, 2.7 mmol/L KCl, 10 mmol/L Na2HPO4, and 2 mmol/L KH2PO4, pH 7.4) and diluted in PBS prior to plating on MRS agar medium. The plates were incubated at 37 °C for 48 h, and colonies were counted to assess survival under lethal acidic conditions. Where indicated, 10 mmol/L of MSG was added. 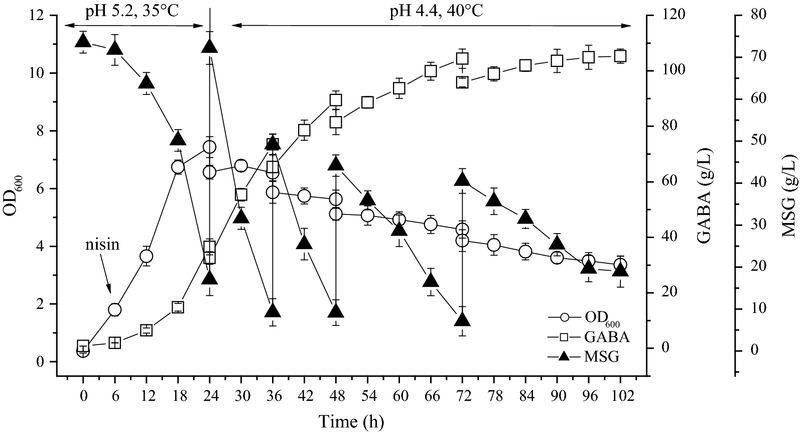 Cell-bound GAD activity was determined by measuring the amount of GABA formed at 37 °C in a reaction mixture containing 0.1 mg (dry cell weight)/mL cell biomass, 0.2 mol/L sodiumacetate buffer (pH 4.8), and 60 mmol/L MSG. One unit (U) of GAD activity was defined as the amount of cells that produced 1 µmol of GABA in 1 min under the above conditions. Specific activity was defined as U/mg DCW cells. The cytoplasmic GAD activity of L. brevis was also determined. Cells were collected and lysed by passage three times through a French pressure cell press (Constant Cell Disruption Systems, UK) at 20,000 p.s.i., followed by centrifugation of the homogenate to remove cellular debris (10,000×g, 4 °C, 10 min). The GAD activity of the supernatant fraction was determined. One unit (U) of GAD activity was defined as the amount of enzyme that produced 1 µmol of GABA in 1 min, and specific activity is expressed as U/mg of protein. Concentrations of Glu and GABA were determined by reversed-phase high-performance liquid chromatography (RP-HPLC), as described by Marquez et al. .
CJL, WRZ and JH designed the experiments and prepared an initial draft manuscript. CJL, HF, YJH, CLP and SH conducted the experiments. LHM and SJY prepared and edited the manuscript. All authors read and approved the final manuscript. We would like to thank Professor Qing-sheng Qi (Shandong University) for providing strain E. coli MC1061 and his helpful technical assistance. All data generated or analyzed during this study are included in this published article and in Additional files. This work was supported by National Natural Science Foundation of China (Nos. 21176220, 31470793, 31670804) and Natural Science Foundation of Zhejiang Province (Nos. Z13B060008, LQ18B060002). 12934_2018_1029_MOESM1_ESM.docx Additional file 1. Figure S1. (A), Gene organization of the gad gene cluster in L. brevis CGMCC1306 (not drawn to scale). (B), Nucleotide sequence and expression signals of the gad gene cluster in L. brevis CGMCC1306. Parts of deduced amino acid sequences of the genes are given below the sequence. Facing arrows, inverted repeats; -10 and -35 promoter sequences are underlined and in boldface; vertical arrows, transcription stare points; rbs, ribosome-binding site (nucleotides indicated in lower case). Stop codons are indicated with asterisks; start codons are in bold face. 12934_2018_1029_MOESM2_ESM.docx Additional file 2. Figure S2. (A), Transcription of gadR is independent from the gadCB operon. PCR results using gad-F1 and gad-R1 as primers. The expected band (~ 573 bp) was only visible in the lane C. M: DNA marker; A: cDNA as the template. B: mRNA as the template. C: genome DNA as the template. gad-F1: GTCAAACAACAATTGGCATC, gad-R1: CAGCCGATAATGAAATACATC. (B), The gadB is co-transcribed in tandem with the upstream gadC gene. PCR results using gad-F2 and gad-R2 as primers. The expected band (~ 571 bp) was visible only in the lane A. M: DNA marker; A: cDNA as the template B: mRNA as the template. gad-F2: TATCTTGTACCGTTTCCACG, gad-R2: ATACATCCTTCAGAAGAACC. 12934_2018_1029_MOESM3_ESM.docx Additional file 3. Figure S3. Nisin-induced overexpression of GadB and GadC in L. brevis. (A): The nisin-controlled gene expression system consists of two compatible replicons: an essential helper plasmid, pNZ9530, encoding the nisRK regulatory genes, and the expression plasmid pNZ8148, bearing the nisA promoter (PnisA). The gadB, gadBC or gadCB segments were under control of the nisin-inducible PnisA. (B): SDS-PAGE analysis of overexpression of GAD proteins. Cells were harvested after 6 hours of induction. Lane M, protein size markers (kDa). Lane 1, L. brevis 9530: pNZ8148-gadCB; Lane 2, L. brevis 9530: pNZ8148-gadBC; Lane 3, L. brevis 9530: pNZ8148-gadB; Lane 4, L. brevis CK. 12934_2018_1029_MOESM4_ESM.docx Additional file 4. Figure S4. Time courses of cell growth, GABA production and residual MSG during the two-stage fed-batch fermentation. The L. brevis CK was cultured in a 5-L fermentor under the following conditions: medium volume 2 L, inoculum size 10% (v/v), agitation speed 100 rpm, and fermentation time 102 h. After cultivation at pH 5.2 and 35 °C for 24 h, the culture temperature and pH were changed and maintained at 40 °C and 4.4, respectively, during the second phase (24–102 h). At 24 h, 36 h, 48 h and 72 h, 200-mL aliquots of MSG (140 g per aliquot) were supplemented into the bioreactor. The pH was maintained at the set value with the addition of 3 mol/L H2SO4 and 3 mol/L NaOH. 12934_2018_1029_MOESM5_ESM.docx Additional file 5. Table S1. Primers used for PCR amplification. 12934_2018_1029_MOESM6_ESM.docx Additional file 6. Table S2. Primers used for key GAD system genes amplification. 12934_2018_1029_MOESM7_ESM.docx Additional file 7. Table S3. Primer used in the quantitative PCR.